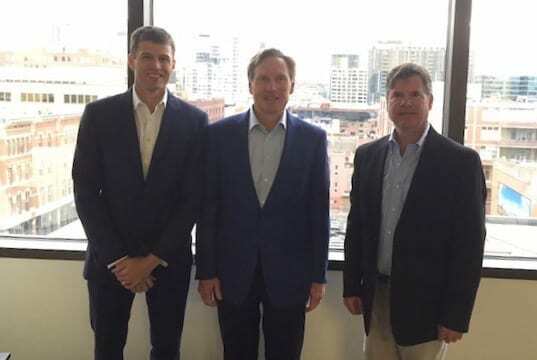 Essex Financial Group, which will close an estimated $750 million in commercial real estate loans this year, is changing the guard. J. Jeffrey Riggs, who founded the firm 26 years ago, is passing the baton to Cooper Williams, who has spent his entire professional career at Essex. “We are proud to announce that Cooper Williams, effective Nov. 1, is going to be the president of Essex Financial Group,” Riggs said from the company’s headquarters on the seventh floor of 1401 17th St. in downtown Denver earlier this week. Riggs, however, is not leaving or retiring from the company he founded, which originally was called Western Mortgage. “I’m a long way from retiring,” the 65-year-old Riggs said. Essex Financial Group arranged a $69.5 million loan for 1601 Wewatta in downtown Denver. Rather, it is a “generational” shift to keep Essex relevant and on top of its game for the foreseeable future. “Honestly, I think by Cooper taking over for me as president, it is going to extend my career working here,” Riggs said. He and Peter Keepper, 50, a managing partner at Essex, have been talking about the transition for the past three years. “We are by far the largest lender in the middle market of commercial real estate investment bankers in Denver,” Keepper said. “By middle market, I mean in the $5 million to $40 million loan range, which is by far the size of most loans made in Denver,” Keepper said, although he added that Essex represents some life insurance companies that could make $250 million loans if needed. -A $33.7 million for Civica Cherry Creek. Williams, who joined Essex as an intern while earning his MBA at the University of Colorado Boulder, said he plans to grow the company. “I think we can be doing $1 billion-plus in loans in the next three to five years, assuming the market cooperates,” Williams said. Riggs said the first time he met Williams, when he was an MBA student, he was impressed. Essex arranged a $65.5 million loan for Re/Max Plaza in the Denver Tech Center. Williams, 36, joined the firm immediately after getting his MBA. Since 2010, Williams had has helped source, underwrite and close more than $850 million in first mortgage debt. Essex is a county in England that is northeast of London, but Riggs didn’t choose the name because he is an Anglophile. “We think a generic name like Essex provides us a lot of bandwidth to do a lot of things,” Riggs explained. Three generations at Essex: from left, Cooper Williams, Jeff Riggs and Peter Keepper at the firm’s heaquarters at 1401 17th St.
“That was our thinking 26 years ago and we have been doing the same thing ever since,” he added. I asked him the dollar volume Essex did in its first year. When he started in the business, Denver was not on the radar screen of a lot of investors. Today, he said he fields calls from investors not only from all over the U.S. but also countries like Korea, Japan and throughout Europe that want to make long-term commitments to Denver. Keeper remembers in the early 1990s when he was working at CB Richard Ellis (now CBRE) and his boss, Sherman Miller, asked him to research the Denver office market for a speech he was giving to NAIOP. “My research found that Denver had the second lowest office lease prices in the world. Only Kuala Lumpur (Malaysia) was lower,” he said. And Essex has been there every step of the way and plans to continue to grow with Williams at the helm. Article originally written and published by John Rebchook at CREJ can be found here.